Attempting to overcome one drug habit by introducing another may make sense to some but not to others. It is said by many that it is harder to come off methadone than heroin. No matter which method you use to stop smoking you will always stop smoking naturally; there is no other way. Whatever pills and potions or methods you use they are all only an aid to the change if mind that is required to stop smoking naturally. The moment your mind gives up the belief in addiction and chooses freedom instead you become free. The problem for most is we have been indoctrinated for decades and had our minds filled with the difficulty of stopping smoking. We’ve been told it’s hard, we’ve seen others struggle to quit and fail miserably. We’ve read the statistics and seen the adverts and we believe all the hype. That’s why we think that replacing a drug for a drug will work. 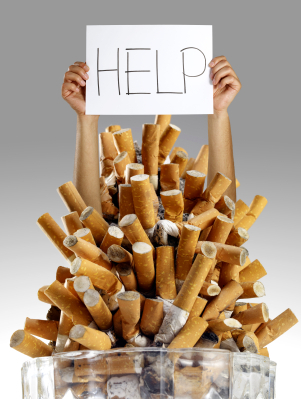 The smoker believes that they are addicted to the nicotine and to the habit of smoking. “What,” they think, “Will I do with my hands when I stop?” That’s why avoiding smoking cigarettes while still getting a hit of nicotine makes sense as it may break the habit of reaching for a cigarette. Once that association is broken the nicotine part of the habit can be broken too or at least that’s the idea. Unfortunately neither actions address the mind where the changes have to be made before success can be achieved. Some of those who use replacement therapy succeed, there are successes from every method of quitting ever invented, and the majority fail. A medical report recently released by Harvard University claimed that (NRT’s) were ineffective in helping people to quit smoking. It is natural to change your mind, you do it all the time and it takes a change of mind or of prospective to overcome the nasty habit of smoking. Every smoker has a relationship with cigarettes and it is your relationship with the tobacco product you are smoking that is the problem. You have given cigarettes a power they do and cannot have not have without you. Remember when you began smoking? In the beginning your relationship with cigarettes was better than it is now; back then you may have claimed cigarettes were relaxing or refreshing. You may have said they helped you to concentrate to focus or think. They even may have made you feel grown up and confident but over the years your relationship gradually changed. Eventually cigarettes became a harmful problem. In the end you may have begun to blame them for your declining health and looks. You may have decided that if you don’t kill them they’ll end up killing you. Whatever you fear or say about cigarettes and it’s different for everyone, describes exactly your relationship with them. You also say they are addictive, they are difficult to stop and you give away all of your power when you declare you cannot do it. You give all the power to a paper stick. One day you take your power back, whether you think it was the (NRT’s), willpower or whatever doesn’t really matter. You take back your power and you stop. The power is within you now, it’s always been there but you gave it away to a substance. You can access the power on your own, you will one day, as long as you seriously want to stop (many people want to stop but are unprepared to be serious about it). Alternatively you can enlist the help of a good hypnotherapist to help you.